In our last post, we looked at the laws and axioms of water vapor and how they relate to peeling paint. In this post, we show how they are applied to avoid paint peeling. Wall Construction. An exterior wall’s construction is seemingly simple. Start with studs, add insulation, and then put wall coverings on both sides. Cover the outside with housewrap, install siding, and protect the siding as needed—possibly with paint. Cover drywall with paint or wall paper. To control vapor diffusion, the devil is in the details! Where is the vapor retarder? What kind of paint or wallpaper is on the interior. How is water drained behind the siding? What condition is the housewrap in? The list goes on. Exterior Peeling. Understanding how air transport through open gaps and cracks in siding is easy. Air blows or is pulled right through them. When wood is not back-primed or sealed on the ends, water vapor is absorbed by the wood, then the paint pops off. The usual way of minimizing this problem is to build and air gap or lap siding to create one behind each piece. Surprise! All siding allows water and water vapor behind it. The purpose of housewrap is rain penetration control. When it gets dirty, has holes, or weathers, it no longer works properly. Instead of repelling water, it lets water right through—to the wood and insulation. Now the water will try to dry out, both to the inside and out as vapor. Note: Housewrap is supposed to keep water out but let water vapor breathe through it. Interior Peeling. Interior paint peeling due to moisture is a result of weather conditions outside trying to get in or moisture that has already gone through the wall trying to come back through. 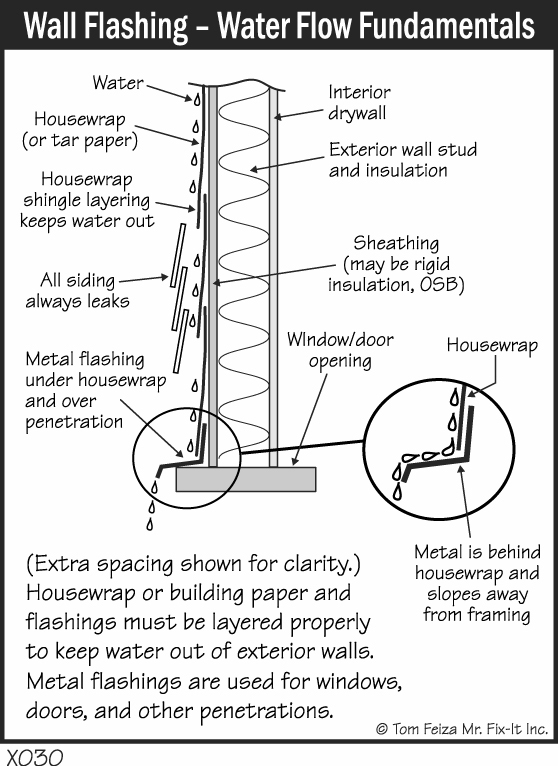 To help protect the wall, a vapor retarder (not a vapor barrier) is used. The general rule is to put in on the warm-in-winter side of the wall. In most parts of North America, that is against the drywall. However, this is a case of applying a rule without understanding the problem. In Atlanta, GA, following this rule puts the vapor retarder on the wrong side of the wall half the year. Some argue houses in the area shouldn’t have a vapor retarder at all. If you need a vapor retarder, install it. Where you put it depends on your climate zone. Just know it has a significant impact on your paint and put it in the right place. If you really want to see moisture laws in action in most parts of the country, install vinyl wallpaper. When it peels, you’ll probably find mold lifting it off the walls. The moral of this story is that interior walls should be painted with a vapor permeable paint, usually latex, to let water vapor pass both ways through it. The goal is to keep the exterior wall as dry as possible and let it dry out. Misapplied Paint. One article I read says 1 in 10 exterior paint projects fail, even when the directions are followed. Other articles on peeling paint don’t mention moisture at all, yet there are a whole host of other reasons. In general, UV light, heat, and moisture destroy paint over time. Otherwise, it’s misapplied paint. We will ask about peeling paint during our homeowner interview. We’re looking for moisture-management clues. However, don’t be surprised if we refer you to a paint manufacturer’s tech rep or a paint consultant (not just a painter or paint salesman) for advice on how to proceed. This concludes or series on Common Complaints. During the 2010 Christmas holiday period, my gift to my sister and her husband was home performance audit. You would think a brand new, tight house wouldn’t really need one. I was shocked! To control dust in her house, it leads to our next series: 51 Holes. It’s about how to control air exchange through attic ceilings—the primary facilitator of air pressure issues.